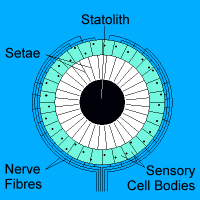 The eye has long been used (erroneously) as an example of a structure which could not possibly evolve. The proponents of this view claim that it is irreducably complex, and that the individual parts of the eye serve no purpose except as a complete organ. This has been thoroughly refuted elsewhere. A similar argument has recently appeared regarding the balance organ of many marine creatures, the statocyst. The statocyst consists of a pouch lined with sensory hairs (setae), within which sits a heavy granule called the statolith. The sensory hair cells are connected by nerve fibres to the animal's central nervous system. The sensed motion of the statolith in response to gravity allows the animal to orientate itself. The statocyst is a very simple organ, and seems to have been one of the first sense organs to have evolved. In fact, there is evidence that it, like the eye, has evolved several times independently. It is found in a wide variety of marine invertebrates, including the Cnidaria, Bivalvia, Coelenterata, and Crustacea. The argument for irreducable complexity states that since the parts of the organ have no independent function, there is no gradual evolutioanry route to the complete organ. The statocyst has only two parts - the setae and the statolith. Sensory setae are found in many species outside statoliths, and are extremely sensitive to vibration. Copepods (a free-swimming marine arthropod) have been studied closely at the University of Hawaii, and it has been found that surface setae are sensitive to vibrations as small as 4nm at 900Hz. These vibrations are used by the copepods to detect possible predators and generate a flight reaction. The assertion that setae are useless outside the context of the statocyst is therefore mistaken. Statoliths are sometimes secreted and sometimes acquired from the environment. In either case, their function before incorporation into the statocyst is questionable, but certainly does not impose an evolutionary penalty. In order to defuse the problem of alleged irreducability, it is sufficient to show that there is a simple, iterative series of steps from a plausible primitive state to the fully developed organ. This is not to say that it did happen this way, merely that it could. The existence of this pathway is enough to falsify the hypothesis that no such pathway is possible. Here, the ancestral state is shown in a. The hairlike setae are arranged on the surface of the organism, and serve the demonstrated function of detecting water-borne vibrations. However, in this configuration they are liable to damage. Mutations that cause indentation of the outer skin offer partial protection to setae by isolating them from gross physical contact with large objects,as shown in b. 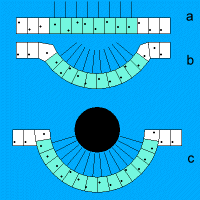 As the indentations get deeper, the possibility of capture of small foreign particles becomes higher, as in c, and a primitive statolith is created. 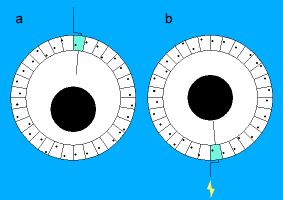 Once a creature has adapted to interpret the new series of impulses from c, it becomes beneficial for it to retain the statolith completely, leading to the closing over of the organ and the fully developed statocyst of the first diagram. The pre-statolith stage of development will detect vibration, but the introduction of the statolith (by accidental inclusion, for example) may cause the animal to erroneously take flight due to overstimulation of the setae. This is unlikely to be a major problem; external sensory setae are often sensiitve to vibrations or one-off events only, and the constant presence of the statolith would excite the sensory hair cells only when it was moving. If the animal is in an upright position, a, then the statolith is not touching the seta and no response ensues. However, as the animal moves into the inverted position, b, the seta is stimulated and the flight reaction takes place. This will at some point almost certainly place the animal in an upright position again. Assuming that the property of "being upright" has some survival advantage, then this configuration is aggressively selected for. Piecewise improvement can then select for two setae, discrimination, and finally the fully developed organ. One other potential point of contention is the evolution of the behaviour required to acquire a statolith in species that do not secrete them themselves. Acquired statoliths are commonly pieces of heavy material like sand or pieces of shell, commonly available on the sea floor. Burrowing behaviour (which is useful for predator avoidance anyway) would certainly contribute to early acquisition of statoliths by "accident". From here, there is again a simple upgrade path for making this behaviour more and more specific, through deliberate burrowing, rubbing of open statocysts against debris, rubbing clawfuls of debris against open statoliths, to the highly specific behaviour of certain shrimps which carefully acquire and place appropriately sized statoliths. Here, we see a smooth progression of function and behaviour, showing that the formation of the statocyst and its associated instincts is perfectly plausible by invoking evolutionary forces alone. Viewed 9281 times since 2007-01-13. Copyright ©2006-2014 Sean Ellis. All rights reserved. Hosted by Kernow Web Hosting.